Good catch. I forgot to update a pointer (didn’t realize there was another function calling the same proc). Also included a fix so that obtaining an item on enemy phase doesn’t say “Item stolen” and play the sad noise, courtesy of SquareRootOfPi (thanks @Onmi for bringing it to my attention). Here’s a patch containing a series of QoL hacks for FE7, bundled together. Some of them exist in some form or another, but I’ve collated them all for your convenience, and ported a few from FE8. Enemies showing growth rates can also be displayed, but cannot be switched. Any chance this can be made to work with your str/mag split? I applied this to a rom that had the split already applied and I get a black screen when I try to open the statscreen. I assume it’s the display growths part of the patch that is causing it because it’s trying to edit the statscreen but it has already been altered by the str/mag patch. That’s planned, yes, but for now you should just comment it out the #include Display Growths line (or whatever it’s called) in the installer. It’s not super high on my priority list, sorry. 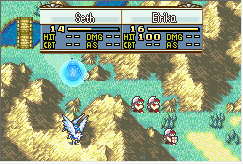 @Kirb has one for FE8. I’m not sure what stage it’s at; it might still have some glitches. He has an actual str/mag split for his gba FE1 remake, whose name escapes me at this moment. I would hope that he would release it before gfe1r is complete (which is partially my reasoning for pinging him here). However, it may require the skill system; I’m not sure. At any rate, I don’t intend to make my own, since that one already exists. Gotcha, I’ll do that for now. to allow this. I used to use Free_Space when I started hacking, but switched to FreeSpace after noticing other hackers preferred that variable. Unfortunately, I hadn’t gone back and updated my old hacks to switch from Free_Space to FreeSpace, which caused me to spend an hour debugging a rom and figure out this was a problem. So I’ve gone back and updated all the stuff in my folder. If you’ve used the following hacks and need to update them, take heed; the variable has changed. NOTE: You can avoid the entire issue by adding “#define Free_Space FreeSpace” (or the other way around, if you use Free_Space instead) to your definitions. Major thanks to Eliwan for doing the stat name graphics. If you weren’t aware, AS stands for attack speed. If you’re using a staff, AS doesn’t matter, so it’ll show --. If you see one or the other character get completely covered by the box, let me know. It’d be extremely helpful if you have the y coordinates of both characters relative to the camera, not the map (ie, top left corner is 0,0). If you don’t know how to do this, get me a screenshot. Likewise, if I forgot any interactions (for instance, I haven’t tested scripted fights at all), let me know. No problem with the hack. It works just fine. 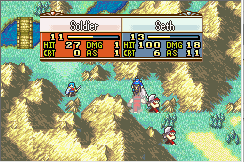 I know this is old, but I’m trying to recreate Latona on FE7, seems impossible, It only works to an extent…I used FF for total range, but as the common fortify uses MP/2 for range, it stacks to that, it heals everybody, but only if one injured unit is in range of the MP/2 healer…So it would require an entire new asm hack to actually do a full Latona isn’t?